Competing with your .300 AAC chambered AR-15 pits you against some of the finest shooters in the country. To get on their level, you need to bring your best game and the best ammo you can find. 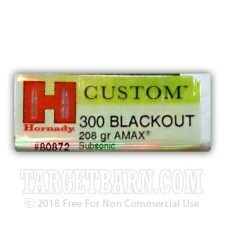 That means getting your hands on some of this Hornady match-grade ammunition! These cartridges come in boxes of 20 and fire a 208 grain polymer-tipped Hornady A-MAX bullet at a subsonic muzzle velocity of 1,020 feet per second for perfect synergy with a suppressor. At typical .300 AAC engagement ranges, they deliver pinpoint precision limited only by the shooter's abilities. 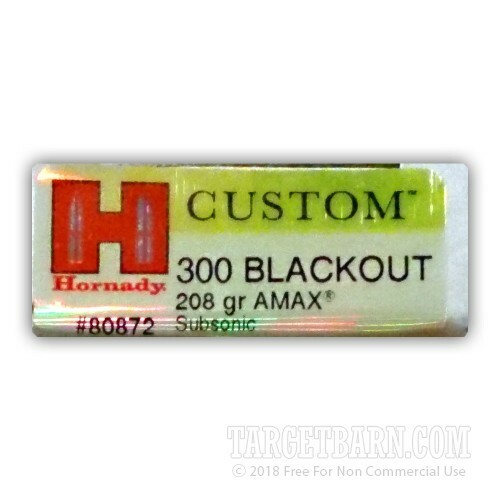 A-MAX match bullets are made using Hornady's proprietary AMP (Advanced Manufacturing Process) which produces extraordinarily uniform bullet jackets for improved accuracy. This ammunition is loaded in Grand Island, using non-corrosive Boxer primers and reloadable brass cases.